Last month, events brought to attention even people who are unclear about how the issues surrounding privacy and data security impact them. When Equifax revealed in early September that its systems had been breached and the financial data of more than half of the U.S. adult population compromised, data security and privacy became a top priority for consumers. A torrent of media coverage, consumer advice, Congressional hearings, and lawsuits have followed. Few organizations have data at the scale and sensitivity level of Equifax, but the lessons to be learned here about the implications from lax information security protocols, inadequate authentication systems, and slow data-breach reporting should resonate with every organization, large or small. Failing to protect user or patron personal information could have disastrous implications, potentially leading to tremendous liability, reputational damage, and even the complete collapse of a company. NISO has been addressing issues surrounding the privacy of user data for several years now. Beginning with our work on patron privacy and continuing more recently in partnership with the Research Data Alliance on a joint project focused on research data and privacy, NISO has striven to find a consensus balance between users' legitimate privacy concerns and the insights to be gleaned from data analysis. These issues are inherently complex, raising mind-numbing legal issues and jurisdictional questions that can keep lawyers employed for decades. NISO's approach has been to take a practical, implemental approach that is built around consensus on core principles. The specifics will change as threats change, but if we are guided by a common set of principles and goals and work on continually enhancing services with those goals in mind, we will improve the entire ecosystem. Data security is also at the heart of another active NISO project. For far too long, the publishing and library communities have relied on a simple, but fundamentally insecure, method of access control: IP-address-based authentication. Working in partnership with the International STM Association, NISO is advancing the RA21 - Resource Access in the 21st Century initiative. RA21 is developing prototypes for the publishing and library community to improve the user experience of using SAML-based authentication systems to access subscribed content and services. Even as some have suggested that the real solution to improving access is free content rather than better authentication, realistically not all content will be free, nor will all services be open. And publishers are not the only ones concerned about network security; libraries also face the problems caused by breached proxy servers, having access curtailed, and making users pass through additional hoops to get to content. Therefore, moving the community away from authentication that is tied to a person's network location is in all of our interests, both from a user experience and a security perspective. I will be discussing the RA21 initiative during NISO's monthly Open Teleconference on October 16, if you would like to hear more about the project. I'll end with pretty common advice: limit your data sharing when possible, use and protect strongly created credentials, upgrade systems regularly, and if you manage private data, closely monitor your privacy and data protections. Sadly, one doesn't any longer have to be the sort of person who wears a tin foil hat to fear data compromise. NISO announces the publication of a new Technical Report, NISO TR-06-2017, Issues in Vocabulary Management. This document is one outcome of the NISO Bibliographic Roadmap Development Project, which was conducted in 2013-14 with funding from the Andrew W. Mellon Foundation. The technical report builds upon the work outlined in the 2014 project summary report Roadmap for the Future of Bibliographic Exchange by discussing policies supporting vocabulary use and reuse, documentation for vocabularies, and requirements for the preservation of RDF vocabularies. Mark your calendars for these webinar dates in October, November, and December! NISO's fee structure allows your organization to gather an unlimited number of staff in a conference or classroom setting to view the event on the day of the broadcast. Access to an archived recording of the event is always included in your registration fee, regardless of membership status. This webinar will be driven by discussion of five significant trends (as identified by the global community of libraries) and their long-term ramifications. How are emerging technologies reshaping existing legal protections and what does that reshaping mean for users and providers of digital content in a networked world? Can we rely on online education technologies to produce a more highly educated workforce? Will the networks of information and communication technologies enable collaboration as anticipated? How much personal data ought a provider to expect in exchange for content access? How far does the right to privacy extend? Information and communication technologies (ICT) are having an impact on human interactions and transactions. How will those transactions look in 2022? Confirmed Speakers: Sayeed Choudhury, Associate Dean for Research Data Management; Hodson Director of the Digital Research and Curation Center, Johns Hopkins University; Rick Luce, Dean, University Libraries, University of Oklahoma; and MacKenzie Smith, University Librarian, University of California - Davis. Paying by credit card? Register online here. The second half of this webinar (scheduled for November 15) will provide an overview of the issues associated with delivering quality metadata by and to various stakeholders. Based on comments heard at conferences and in meetings, it's an old issue. But what are the existing barriers to delivering reliable metadata? What improvements might be made in the process? What stands in the way of successful implementation? Confirmed Speakers: Judy Luther, President, Informed Strategies; Phil Leahy, Services Relationship Manager, Eduserv and Jon Bentley, OpenAthens Commercial Director, Eduserv; Ellen Rotenberg, Director, Product Management, Platform Capabilities and Services, Clarivate Analytics, and Rick Stevenson, Manager, Tech Operations, Clarivate Analytics. Paying by credit card? Register online for just Part One or just Part Two. Better yet, save 25% on the November event by registering online for both segments! In 2016, NISO announced an initiative aimed at the development of best practices for documenting and understanding users' paths between discovery of content and accessing the content. Do users usually come in from a discovery service, Google Scholar, or some other available channel? What should that signify to service providers? What does that mean for libraries? This session will spotlight the size and scope of the issue as well as the progress that may be made towards its resolution. Confirmed Speakers: Ken Varnum, Senior Program Manager for Discovery, Delivery, and Library Analytics, University of Michigan; Peter Vlahakis, Product Manager, ITHAKA and Dan Paskett, Director, Shared Shelf Outreach Coordinator, ITHAKA; other speakers are to be announced. As mentioned above, NISO has just released TR-06-2017, Issues in Vocabulary Management. In this blog post, Hedden, a member of one of the working groups that produced the technical report, looks at how the document differs from ANSI/NISO Z39.19-2005 (R2010) Guidelines for the Construction, Format, and Management of Monolingual Controlled Vocabularies; what the "Issues" of the title are; and what is included in the report. Section 108 of the U.S. Copyright Act outlines exceptions to copyright law for libraries and archives. This report acknowledges that there are issues to be tackled regarding the Act, and that the question of how they should be solved is controversial. The report has several aims: "First, to review the issues raised over the past decade of revision work; second, to outline the Office's current views and proposals on the various revision issues; and third, and most importantly, to present and explain model statutory language for a new section 108." CLIR's report A Splendid Torch: Learning and Teaching in Today's Academic Libraries features essays by the organization's postdoctoral fellows on "the evolution of the learning commons, information literacy instruction, digital humanities teaching in libraries, spatial literacy, collaboration in digital special collections, and 3-D printing and pedagogy." U.S. copyright law has its quirks, but consider the situation in Canada, where government-prepared works belong not to the people but to "her Majesty." 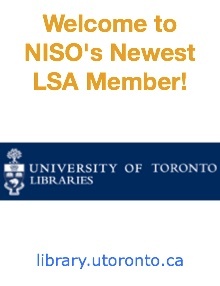 Amanda Wakaruk, a librarian at NISO LSA Member University of Alberta Libraries, is fighting back via a House of Commons e-petition. Whether or not peer reviewers should sign their reviews is a controversial topic that is getting some attention of late. Here, PLOS adds research results to the debate, describing the findings of a study in which it asked reviewers about their choices. COUNTER has announced Release 5 of its Code of Practice, as well as supporting materials: The Friendly Guide for Providers and Technical Notes. January 2019 is the deadline for compliance, notes the organization. This vote for asks if ISO/CD 19580, which was approved in June 2017 as CD, should instead be issued as Technical Specification due to the project-limit time. This ballot closes on October 4, 2017. At the ISO/TC 46/SC4 Plenary meeting in Pretoria on in May of thise year, attendees drafted Resolution 2017/03 - Establishment of a working group for ISO 15836-2 Dublin Core. appoints Juha Hakala to act as convenor of the new working group with a term of three years, ending 2019-12-31. This ballot closes on October 10, 2017. This document specifies the transactions between libraries or libraries and other agencies to handle requests for library items and the following exchange of messages. This ballot closes on October 16, 2017. As discussed during the TC46/SC9 plenary meeting in Pretoria, ZA in May of this year, there has been little progress on the project to revise ISO 15707. Noting the work to improve on existing service and build new ISWC services that have been done by the RA responsible for maintaining the ISWC standards, and the stated desire of the RA to stop work on the revision, the Convenor consulted with WG2 members to discern a recommendation about next steps. After consulting with the Working Group members as instructed by TC 46/SC9, the recommendation is that the current standard is sufficient for the improved services and the revision is no longer necessary. This ballot closes on October 20, 2017. This is a ballot to approve the nomination of Ms. Stella Griffiths as ISO/TC46/SC9 chairperson for a new 3 year-mandate. This ballot closes on October 25, 2017. This is a ballot to approve the nomination of Mr. Juha Hakala as ISO TC46/SC4 chairperson for a 3 year-mandate.